Salina Central senior Elisa Backes was frustrated by Salina South’s defense all night long. But when the game mattered most, the future Nebraska-Kearney Loper made the difference. Backes spun down the left lane and buried a left-handed hook shot with four seconds left to give Central its 11th-straight win over rival South, 48-44. The game started with the Mustangs in control 12-6, but the Cougars clawed back to 12-10 at the end of one. South took its second lead of the game and pushed its largest cushion to 20-15 at the 3:57 mark in the second, following a three by senior Sydnee Connell. Central climbed back to within three, down 22-19 at halftime. Just 17 points were put on the board in the third frame, six by Central junior Selah Merkle. The Mustangs had 10 in total, knotting up the score at 29-all at the end of the third period. Central flirted with its largest advantage, grabbing a 44-39 lead after a free throw and bucket by sophomore Peyton Griffin. South countered at the foul line as junior Camdyn Schreiber hit all four of her free throw attempts. After a Mustang turnover, senior Jacie Marcotte banked in her third three of the quarter to lock up the score at 44-44 with 30 seconds to play. That’s when Backes recorded two of her 14 points in the final frame for the go-ahead score. Backes had a game-high 21 points. Merkle finished with 11. South’s Marcotte had 12 points while senior Angie Hall added 10. 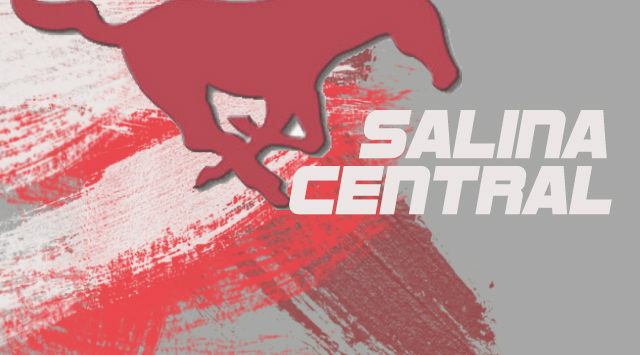 Central (3-2, 1-2 AVCTL-I) welcomes Campus on Tuesday. South (1-4, 0-3) takes on Derby. After watching a nail-biter, the boys team made sure to control the game early. Following a 15-7 advantage after the first quarter, Central turned to the shooting of senior Sam Shaffer and junior Harper Williams. The duo had four of its six triples of the half in the second quarter, ballooning the cushion to 35-16 at the break. Senior Ethan Speer led the charge in the third, pouring in seven of his 11 points in the third frame. Shaffer and Williams each had 13 points while senior Ethan Kickhaefer scored a career-high eight points. Salina South junior Isaac Mitchell had his best game of the season, recording multiple blocks and scoring 11 points. Central (4-1, 2-1 AVCTL-I) stays at home to face Campus on Tuesday. South (1-4, 1-2) has a home tilt against Derby.